To ensure a successful partnership, R & H works with clients during all phases of product manufacturing: from early quoting and costing, to pre-production test samples for the verification of quality standards (PPAP), to full production runs. In many cases, these partnerships, lead to us running the same jobs for years or throughout the life of the product line. In the automotive industry, the custom parts we make directly impact the consumer. During the course of long production runs, our quality needs to be as high at the end of the run as it is at the beginning. From ball studs to shift levers, our parts will stand up to the demands of daily commuting to work or the long road trip on vacation. n the industry that represents our biggest customer base, a lot of long hours and countless miles test the durability of our custom parts. Whether it’s a part in the driver’s seat that provides a smooth ride, or in windshield wiper assemblies that allow the driver to see in the pouring rain, you can be assured that our parts are in it for the long haul. he harvesting season demands incredibly long hours and hard work. That’s why the drive and commitment of farmers is second to none; and it’s why the ability of our custom parts to withstand the power and torque constantly applied to them puts them in a class of their own. R & H’s commitment to the little things helps keep the hydraulics functioning and farm production on schedule. The military cannot risk any piece of equipment failing in its transportation vehicles. The stakes are too high and lives on the line. We build our parts to meet the military’s high expectations and strict specifications for durability and ruggedness — even under the stresses of the roughest terrain. Because safety is a top R&H priority, the gas valves we make for the appliance industry meet the most stringent safety standards. We subject our parts to detailed quality checks at frequent intervals using highly calibrated gauging equipment. When it comes to medical equipment, precision and repeatability are essential for the safety and well-being of patients. 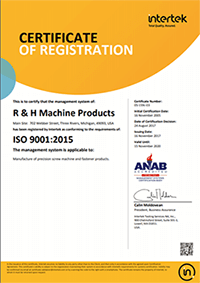 R&H’s state-of-the-art equipment and a continuous dedication to quality ensures that every part meets the highest standards of the medical device industry. If you’re hanging off the side of a mountain during a climb, you expect performance from your equipment no matter what the weather. Similarly, when you’re snowmobiling in the Siberian tundra, absolute performance is essential. R&H has partnered with global leaders of outdoor equipment to ensure that even the smallest of custom parts function as expected —under even the most extreme circumstances.